Devil Pig : Forum » New 50 card decks? Forum » [English] Heroes of World War II » Rules V2 section » New 50 card decks? I'm curious about the German and Soviet 50 card decks. Are they really just 50 cards that are not meant to modified at all? So, no extra fighter/bomber cards and no extra artillery cards? I have experimented with my HoN decks (US, German and British) and pared them down to 50 card decks too. But I guess I need to assign some bonuses to "useless" cards like in the new deck has. That is a bit of a leap… especially since there are Elite units that bring their own 6 card training sets and are all v2.0 products. You don't remove any of the 50 cards from the new version of the deck, but that does not mean you cannot add cards. By giving "specialty" cards a secondary value (with the Alternate Bonus) it just saves a lot of time in scenario setup. You don't have to remove any cards from the deck and at the same time you do not end up with superfluous cards that waste a draw. But the HoS box comes only with two 50 card decks, so there won't be any planes or artillery cards. That is what I meant. Naturally some expansions can add six more cards (like the demon hunters adds six indian cards for the majestic deck). I'm just wondering if the pigs are getting rid of the air support and artillery support in card form and rather add them as tokens. There is already artillery tokens with some high command options. And HoBR seems to have air support as army tiles. I closely examined the SoN decks (Majestic, Black Sun, and Mythos) to determine which cards should have alternate bonuses and what the bonus should be. Generally, it's any card that is situational or hard to use. I made one decklist of 45 cards that is shared between all factions. Just add the 5 additional faction specific cards (i.e. American Way of Life, Booby-Trapped, Tea Time, etc.). Each unique card is featured in this deck, except for two: Advance! and Repairs. This was a matter of personal preference. * Elite Training (x6) – 20 pts. Each allows you to add some of the unused cards back into the deck. For example, you could add an additional copy of Weak Point, Battle Rage, and Suprise! into the deck. Note: I haven't used this option yet, but I've included it for those interested. Yes, artillery and aircraft will be manage with markers. The card list is already available in one thread on Heroes of Stalingrad forum sub-section. 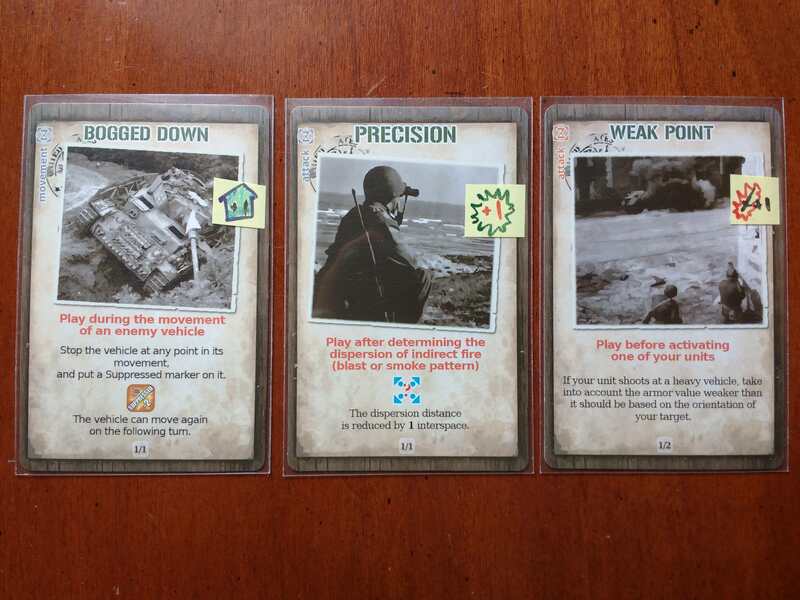 I went ahead and glued some symbols (move, assault and shoot) to my US, German and British cards. I closely checked the Majestic, Black Sun and Section M decks to see which cards I added a symbol and which symbol I glued in the cards. I now have 50 card decks for US, German and Brits, mimicking the newer 50 card decks. I still will buy the new US and German decks when they become available as I'd like to have an official decks, but my improvised decks will let me use the new style meanwhile. It had become tedious to select the decks in the old way at the start of each game, so I welcome the use of these new style decks. All the same. I have already upgraded my old deck. The idea of a fixed 50 cards deck was great ! As an update to this thread — when Axel said "managed by markers" he meant that the Airstrike and Artillery cards are being dropped as a mechanic for HoN. You can still use them, of course, but DPG has switched to recruitment options that have markers and require an Order token to activate. This new mechanic can already be seen in the reinforcement packs we saw last year (4th Armored, 7th Armored, 1st SS Panzer). So there are no Airstrike or Artillery cards in Heroes of Stalingrad, and there will be no cards in the new German and US 50-card decks. Buy the 3x Airstrike or 1x airstrike as normal, but do not mix those cards into the deck. Instead draw 1 or 3 (or 4 if you bought both Airstrike options) random airstrike cards and put them aside. When you want to use airstrike, put an order chit on top of the air strike cards and when the order number is activated draw 1 random airstrike card from those you put on side and use it as per cards instructions. I'm not sure if the options cost should go up because you get to use the airstrikes more reliably? Maybe roll a die when trying to call an air strike. On 4+ you can use it, otherwise the order is wasted and the card remains in the air strike deck for future use. That way the airstrikes are not as reliable, but still propably comes up faster than if mixed in the deck. I will use this house rule until the new style airstrikes become available. For artillery, I already have counters for the new style artillery, so I will propably retire my artillery cards. Any estimate for when the new decks will be available? I made one decklist of 45 cards that is shared between all factions. Just add the 5 additional faction specific cards (i.e. American Way of Life, Booby-Trapped, Tea Time, etc.). Any news if these are still being made and if so when they would be available to purchase? The decks have not been made yet. They will be part of the upcoming HoN Compendium Edition core box. There is some discussion of making them available, but DPG had to ensure they can do that so as to make it reasonable for them and the customers both. How will the new 50 card deck for the US and Germans affect Commonwealth card deck? Same deck for all three factions? Well first of all: You can still use the old deck in a game, it will just operate under the old rules. The underlying mechanics really have not changed, so the old deck works fine. Beyond that, I have no info about the CW deck. However, the US and German decks are not the same, just as the original decks are not the same. Granted that is somewhat subtle. Even in the first edition, most of the cards in each deck were the same (barring some title changes, perhaps) but there were a set of faction-specific cards in each. The same sort of thing would happen with the new decks.